Hello and welcome! Susie hosting the blog today! I am bringing you a fun summer-themed layout featuring several of Quick Quotes' fabulous PowderPuff Chalking Inks. 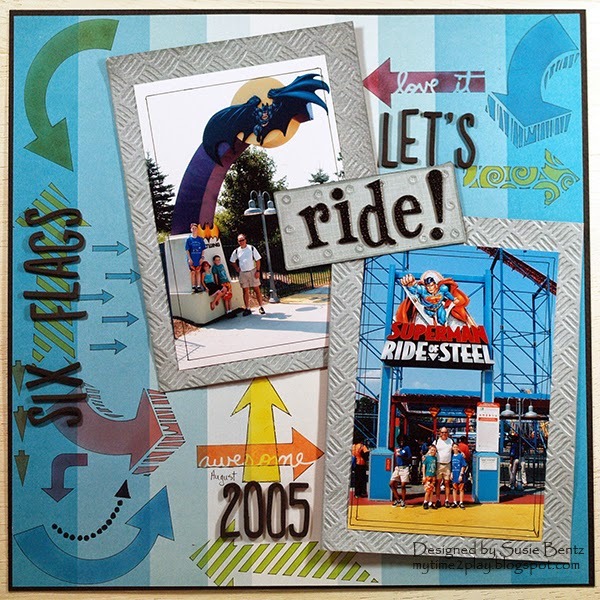 I was inspired by the name of the Superman roller coaster, "Ride of Steel", to create these textured photo mats by embossing gray paper from the Sheer Joy Collection. I inked the edges and raised texture with Feather Gray PowderPuff Chalking Ink. I positioned the photos on top of a paper from the Dream Big line and then pulled out the rest of my PowderPuff Chalking Inks and some arrow stencils - and started to play!! I used Post It notes to quickly and easily mask off the openings in the stencil that I was not working with at the moment. I love the way the background paper changed the colors of the inks! I used black dimensional Alphas for the title(s). I should add that I did not adhere the photos and mats in place until I had finished stenciling the arrows. It is much easier to work without any obstructions! Cute! I love all the fun arrows and embossing! Great job on your layout! love all the different arrows! Makes the page fun!